Perfect for naps and deep slumber! Who said luxurious college bedding needs to be extremely pricey? At DormCo, we know you're probably on a budget, and with so many essential dorm items that you'll need to get it shouldn't have to come down to you not getting something you really want. 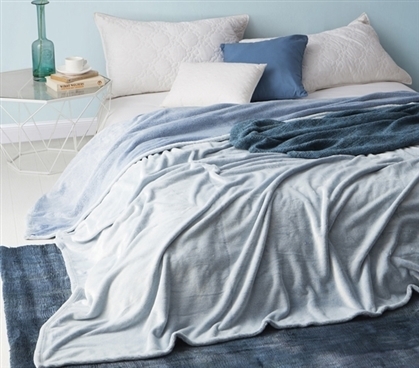 And if you love comfortable dorm items, you'll most likely really want our Coma Inducer Full Blanket - Frosted - Pacific Blue to add to your Full sized bedding. This one-of-a-kind college bedding blanket will add unique comfort and style to your dorm room at one low price! With everything this unique Full size dorm blanket has to offer it definitely should be considered a college essential! If you're going off to college in one of the colder states, this college blanket is definitely a must have! Made with an ultra soft plush microfiber, this extraordinary Full blanket is meant to keep you warm and cozy. The best part about this Full sized blanket is you don't just have to use it on your dorm room bed. Add this stylish blue college blanket to any spot in your dorm room and it can help accent your college decor. 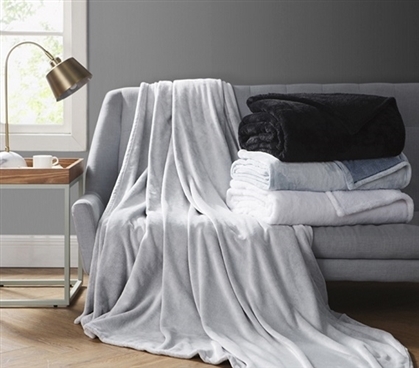 For ultimate comfort and unique style our Coma Inducer Full Blanket - Frosted - Pacific Blue is the way to go!